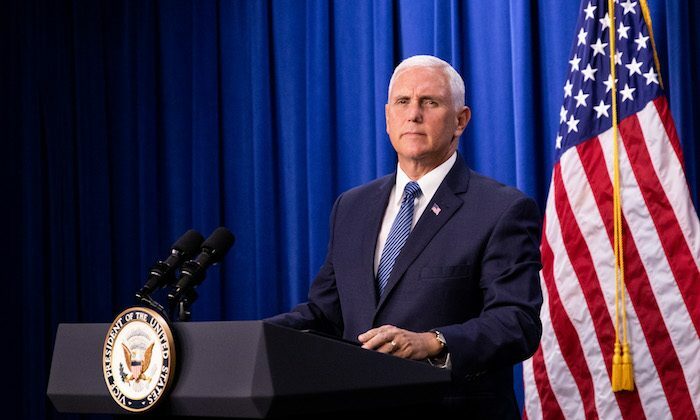 Vice President Mike Pence lambasted a number of high-profile Democrats—all of them 2020 presidential contenders—in a string of Twitter posts on April 12 as he toured areas in Iowa and Nebraska that were devastated during last month’s flooding. Democrats failed to pass a recent disaster relief bill meant for the state. Pence specifically called out Sen. Elizabeth Warren (D-Mass. ), Sen. Cory Booker (D-N.J.), Sen. Amy Klobuchar (D-Minn.) and Sen. Kirsten Gillibrand (D-N.Y.). The next time @ewarren, @BernieSanders, @CoryBooker, @amyklobuchar or @SenGillibrand come to Iowa asking Iowans for their support – Iowans should ask them why they all voted AGAINST disaster assistance for Iowa! Iowa is still flooded, families need help. Congress must act NOW! Senate Republican legislation provided a $13.45 billion bill for disaster relief from recent floods, hurricanes, and wildfires on April 8 but it was blocked by Senate Democrats. The Democrats argued that the more than $600 million provided to Puerto Rico was not nearly enough. Congress is currently in a standoff over the issue. In another post, Pence noted the damage caused by the flooding in Iowa. He said that President Donald Trump has tried to help Iowans, while Democrats have chosen to obstruct. A 60-vote supermajority needed for the disaster relief bill to proceed to final consideration was voted down by a vote of 44 to 49. “I have never been more frustrated as a United States Senator than I am right now. This is pure partisan politics,” Sen. David Perdue (R-Ga.) said on Twitter after the vote. Perdue sponsored the legislation. Pence was joined by Iowa Gov. Kim Reynolds and Sens. Chuck Grassley and Joni Ernst in touring an area around Pacific Junction, a community in southwest Iowa where floodwaters still prevent some residents from returning home more than three weeks after the flooding began. Pence last month toured areas swamped by floodwaters in Nebraska, where state officials estimate nearly $1.4 billion in damage and losses. Earlier in the day, he said that “huge portions of the Midwest have been impacted by historic flooding,” and noted that he and the president are committed to helping those impacted by the disasters.